Jacob bought me The 1975 concert tickets for Christmas and booked us a hotel for the night in Sheffield! I am super excited to see them live and I am hoping they will do a couple of acoustic songs in the set so we can really hear Matty Healy’s voice. 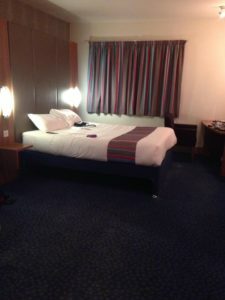 We travelled to Sheffield Meadowhall around 2pm and checked into our hotel at 5pm, we are staying at The Travel Lodge (as you know from a previous review I wrote, Travel Lodges are not my favourite). However, as soon as I walked into the hotel lobby, I knew our stay would be a pleasant one. 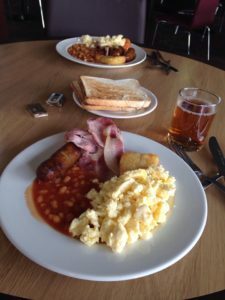 There is a small, cosy restaurant in the reception area which serves main meals in the evening as well as unlimited cooked breakfasts in the morning. The prices are not too bad, £8.50 for unlimited breakfast with tea, coffee or juice to choose from and on the tea time menu you can choose two courses for £12 (with children eating free with a paying adult). When I opened the door to the hotel room I was pleasantly surprised by the size of the room! It was quite large, with a neatly made double bed in the centre of the room, which had shelves and wardrobe space hidden behind the headboard of the bed! The room was lovely and warm on arrival as the staff had put the heater on for us! The bathroom was a decent size too, the shower even had a little seat inside. However, I would have been more impressed if there was a bathtub, as I love to have a nice relaxing soak in the bath when we stay at hotels. Compared to our last Travel Lodge experience, this hotel is much better! I understand that there are smaller Travel Lodge hotels, so I do not expect them all to be perfect… but there are basic elements that should be part of every hotel. For example, the hotel that we stayed at in Lancaster was not great… there was a lack of plug sockets (none of which were near to a mirror! ), the shower overflowed and flooded the bathroom and the breakfast was over-priced considering all they served was cereal. Here, there is a nice seating area in the bedroom with a mirror on the wall and two plug sockets underneath. The shower also has a glass door here to prevent flooding the bathroom! I think both of these things should be essential in all hotels… I understand not all hotels can have their own restaurant, but simple things like this should be a must? The concert doors opened at 6:30pm with the gig starting at 7:00pm, the venue was approximately half an hour walk from our hotel; we could have driven there but decided to leave the car be for the evening… after all we did spend 2 hours in the car on the way here. The walk to the arena was not that bad of a walk! Luckily the weather has picked up a little bit so it was not too cold out. When we arrived we purchased some drinks and headed to our seats… the prices are always extortionate in places such as this, with a bottle of Fanta costing £2.50 and a pint of beer costing £5.00! stage fairly well. We missed the first supporting act, and the second support act was not really to my taste, but I have definitely heard much worse! When The 1975 came on the stage the arena went crazy (including me of course) and they definitely did not disappoint! The entire show was amazing. 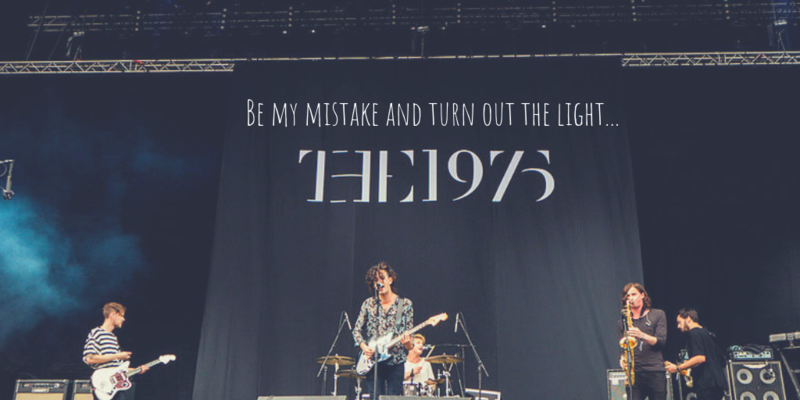 Matty Healy’s voice is like something from an angel. Despite having seats, we were on our feet throughout the concert. It was hard not to be when the music was so catchy! I was so happy that they also sang some of their other well-known songs on top of singing the songs from their latest album. I really did enjoy every second. I was just gutted that I didn’t have a better phone or camera with me to take pictures and videos. 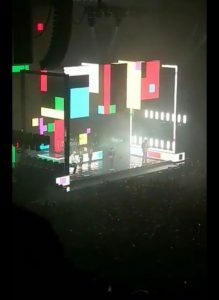 I would also like to mention the fun and quirky dance moves that Matty Healy was rocking… they were amazing and certainly brought smiles to the fans faces. A multi-talented man! And the stage was set up brilliantly too! The lights were insane and it was all put together perfectly. At the end of the concert, we checked out the merchandise stand. I was shocked by how much things cost at concerts these days! Going back a few years, t-shirts were priced at around £15-20 and hoodies from £30-40… now a t-shirt costs £30 and hoodies are £50! It is safe to say that we walked away empty-handed this time around. But as we were leaving the arena and heading home, there were people selling ‘knock-off’ merchandise! 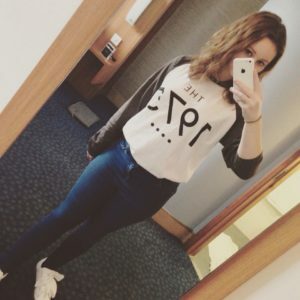 I treated myself to a 1975 Baseball Tee for just £10 and I am super happy with it! Yes, it is not official merch… but it is pretty and it is comfy and it was a bargain. When we got back to the hotel we made cups of tea and watched some Family Guy on the TV before settling for the night. I have to say, I had a much better sleep at this Travel Lodge that I did in the Lancaster Travel Lodge. The room was much quieter and the bed was comfier too! In the morning at around 10:30pm we packed most of our things and headed down to the reception area for breakfast. We both chose the unlimited cooked breakfast. It was not the best quality of food, though I do believe if we had eaten earlier it would have tasted better as it would have been fresher. I had some bacon, scrambled egg, beans and sausage (although the sausage was Cumberland and I personally was not a fan). I then had a small bowl of Special K.
Our drinks were included with the price of the breakfast, so Jacob selected a latte and I helped myself to a couple of glasses of fresh apple juice. After we had finished eating we went to finish packing before heading back to reception to check out of our room. Checking out was super easy, all we had to do was hand them our room key and it was all done. The staff were very polite and attentive to their customer’s needs and we had a very welcoming stay. I would happily stay here again in the future. So, overall we have had an amazing night in Sheffield! The hotel was great and the concert was unbelievable!